Several of the Komondor temperament traits make this breed a great guard dog. The Komondor dog has a long history of guarding flocks, and he protects his family with the same level of dedication. Before we continue you should know that the plural of Komondor is not Komondors but “Komondorok”. 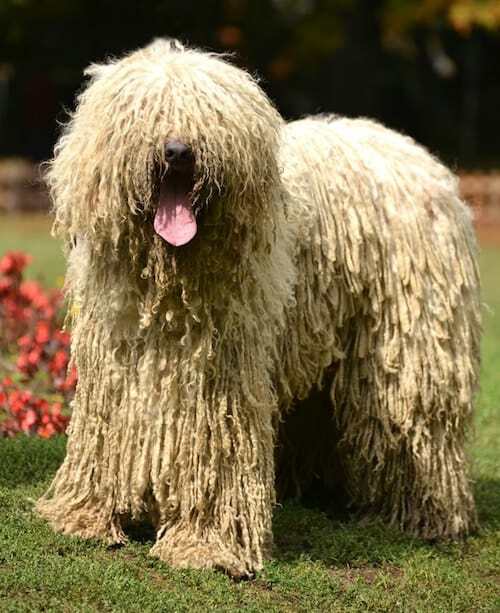 There are six traits of the Komondor temperament that will help you decide whether this is truly the right dog for you. The Komondor’s fearless nature makes him apt for guard dog duties. And throughout history, this breed has done justice to that role. After all, when you have to guard a flock from wolves, foxes, and other impending danger, you have to be fearless to accomplish this task. While not aggressive, some Komondorok are never fully comfortable with those he does not recognize as members of his own family. When introducing him to a new friend or family member he has never met or hasn’t seen in a while, stay close by. Introduce him carefully and supervise the visit to make sure he doesn’t become overly protective of his family. When Komondorok don’t have to worry about being on their guard, they are extremely affectionate to their families. If you’re looking for a dog that is good with children, the Komondor is definitely one of them. Despite being a great guard dog, the Komondor is also wonderfully gentle. While generally a quiet and gentle dog indoors, he’s not exactly suited to apartment living. The Komondor's bark can be deep and alarming. It’s not the best bark for neighbors who live in close proximity to one another. When you’re a guard dog, it’s just as important to be calm as it is to be protective and fearless. For this reason, the Komondor is unsurprisingly calm – which also adds to his gentle nature around children. Komondorok are steady and dependable dogs when things are normal. However, if the situation changes and someone goes after his family, the gloves come off and he’s ready to defend them with all he has. The original breeders raised the Komondor to be an independent thinker who could solve problems on his own. While this makes him a fantastic guard dog, it can also be incredibly frustrating while training him. Another example of the Komondor's independent temperament is that at about two or three years old, this breed is typically able to fully take care of itself. The Cumans brought the Komondor breed to Hungary during the 12th and 13th centuries. If you’ve ever thought while looking up the Komondor vs Puli that the two appeared to be related, you’re right! The Komondor is related to the Puli, the Pumi, and the Old English Sheepdog, to name a few. When training a Komondor puppy, it is important to remember that they are independent thinkers. This means that they can become overly protective if you do not train them to understand that you are the boss, not the other way around. The Komondor should be fully able to understand and follow your commands by the time he is a year old. The earlier you socialize him, the better adjusted he will be. If you need the help, sign him up for puppy obedience classes. For help with training, you Komondor take a look at The Online Dog Trainer by Doggy Dan. Doggy Dan is an expert Dog Trainer based in New Zealand. His online resource contains Hundreds of Excellent Dog Training Videos that will take you step-by-step through the process of developing a healthy, happy well-behaved dog. 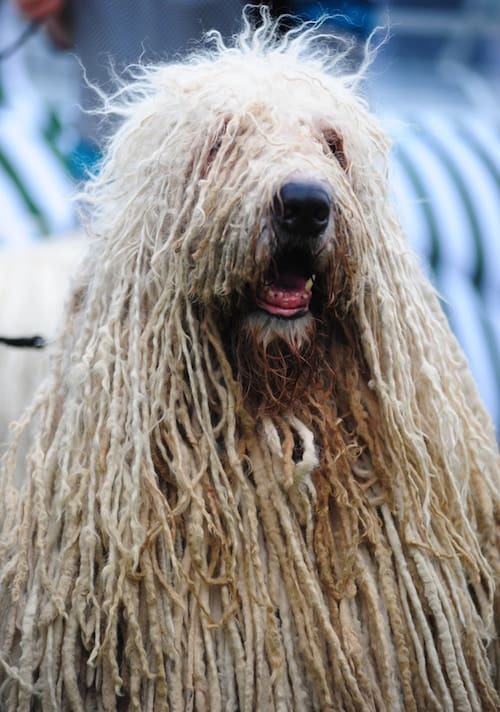 One look at the Komondor’s hair may make you nervous about how much work is involved in grooming him. However, once the dog reaches 9 or 10 months old, a breeder or professional groomer will separate the coat’s “clumps” of hair, or “plates.” These separated plates then grow into cords. 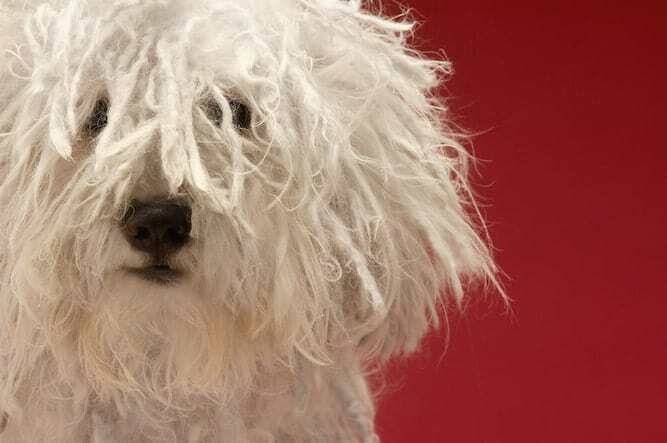 For the Komondor, brushing is not so much an issue as bathing is. If you do not properly dry his coat, or if there is any shampoo left over, you will know because of the foul smell. 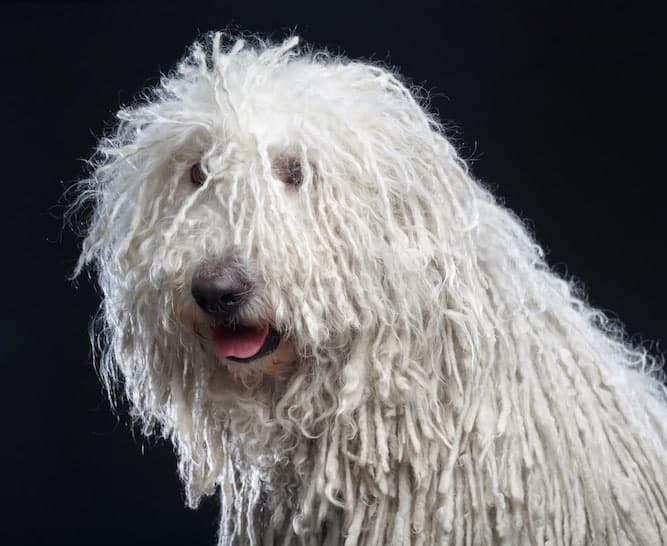 If you’re wondering “is the Komondor hypoallergenic?”, the answer is that no dog is, unfortunately. The best way to tell if you’re allergic is to spend some time with the dog you’re considering taking home to see if an allergic reaction develops. You may find a shaved Komondor occasionally. Some people shave the whole dog, while others choose to only shave the dog’s head to keep the hair out of his eyes. As for coat color, the only color a Komondor comes in is white. So, if you’re looking for a black Komondor, sorry but you’re out of luck. Komondorok are pretty athletic for their size and need a good deal of exercise each day to keep him happy and healthy. Letting them run free in the yard is a good way to exercise him. You can also take a Komondor for a long walk. If you have other dogs, a romp around the yard with them should be enough to satisfy his needs. The one place you actually should not take him, unless he is well trained, behaved and you are fully in control, is a dog park. This is because his guarding instinct may alert him to dangers that aren’t actually there. For example, he may feel like he has to protect himself from other dogs who are running around without a leash. He also may assume that the group of dogs playing at the park are actually a threatening pack about to gang up on him. The average Komondor size is between 25 and 27 inches for a female, and between 28 and 30 inches for a male. The Komondor's life expectancy is between 10 and 12 years. Note: Don't let the issues above scare you. The best way to approach health problems is to prevent them in the first place. The Ultimate Guide to Dog Health is a great place to start. Get a copy to keep at home. It will help you prevent the painful health issues that can plague your lovely Komondor dog from expressing his personality and maximizing his life expectancy. Now that you've decided on a Komondor, you probably want to know how to go about purchasing one. You can find a Komondor for sale through a breeder or from your local animal shelter. The average Komondor price is upwards of $1,000. The Komondor puppy price varies based on the breeder selling the dog, the location of the breeder, and the how “pure” the dog's lineage is. If you are researching Komondor puppies, you may be able to find one at your local animal shelter. A Komondor puppy for adoption will always cost less than one up for sale from a breeder. If you don't find a Komondor on your first go-round, don’t feel discouraged. Shelters are always getting new dogs in, so you never know. If you're looking for a Komondor breeder, a good place to start is The Komondor Club of America. That’s because the club is an officially recognized club of the AKC, and is the club responsible for the protection and preservation of the breed in the U.S.
You can utilize the club’s webpage for information about breeders, like where to find them and how to contact them. 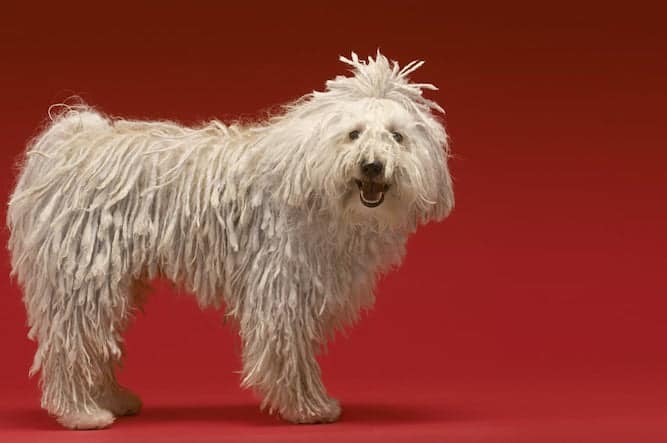 Conclusion: Why the Komondor Dog? The Komondor temperament makes him a guard dog like no other. The Komondorok are calm, steady, and protective dogs. They watch over their family like they do when guarding a flock with their life. However, in calmer times, the Komondor is a gentle lovebug, making him a fantastic dog to have in a home with children. He’ll guard them like a flock of sheep and love them like a nanny. More than brushing, you must pay attention to properly bathing him. As long as his cords have grown out, it’s more important that his coat does not stink. His coat can be smelly if you don’t dry it properly, or if you don’t wash out all the shampoo, so be sure to do both things well.